Verifying your information with SiteLock is a necessary step to creating a site with the SiteLock Trust Seal. This article can walk you through the necessary steps to get your domains and account information verified with SiteLock. 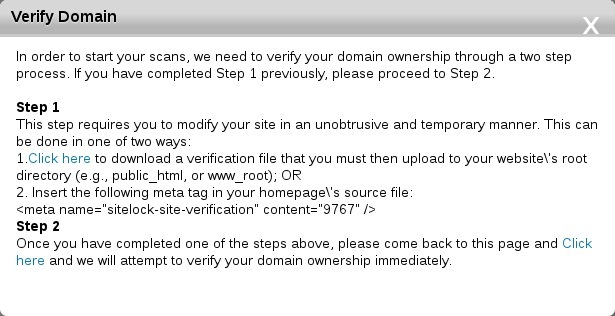 Note: You will be unable to verify your domain unless it is properly pointed towards your Just Host account. Please verify that your domain is pointed correctly before continuing with this tutorial. Once logged in, you will be looking at your Dashboard. Look for the following verification notices shown in the picture below. As you can see, there are two ways to verify your domain; we will be dealing with the easier first option, as the method using code could have the potential to break your scripts. Click on the first "Click here" link in the dialog box which will download an html file to your local computer. Please remember where you saved this file; it will generally default to your Downloads Folder. After the file is downloaded, you will need to log into your Just Host cPanel. Please keep your SiteLock dashboard open as we will need to comeback here after the html file has been uploaded to your account. Once logged in to cPanel, open the "File Manager" located in the "Files" section of your cPanel. Another popup will occur, the "File Manager Directory Selector". Make sure to select Web root to get into your public_html directory. If you open the home directory, that is fine. You will just need to navigate to the public_html folder to make sure the file is uploaded to the correct directory. Once you are in the correct directory, public_html, please hit the Upload button on the top of your File Manager. You will then be taken to the following screen to upload the verification file. Once you have selected the html file from your local computer, click okay and the upload will begin. You will see a green status bar in the bottom right of the screen showing the progress of the upload. Note: If you are still having trouble getting your domain correctly verified, double check that all the above steps were performed correctly and double check that your domain is pointed correctly. If you are still unable to verify the domain, you can contact support via phone at 888-755-7585 or Live Chat so we can verify the file is correctly uploaded, or you can submit a ticket directly to SiteLock using the "Support" link at the top of your SiteLock dashboard. To verify your phone number, first check that the phone number is correct, and then click the "Resend Code" link next to your number. A dialog box will appear and confirm that you want to resend the verification code; click "Yes". You will receive a phone call from an automated system providing you with a verification code. To input the verification code, click the "Submit Code" link next to your phone number on your dashboard, and enter the provided code to verify your phone number. To verify your address, first check that the address is correct, and then click the "Resend Code" link next to your addess. A dialog box will appear and confirm that you want to resend the verification code; click "Yes". You will be mailed a verification code to the listed address. Once you have the verification code, click the "Submit Code" link next to your address on your dashboard, and enter the provided code to verify your home or business address.